Launched in 1998, Hull 050 began its operational life trading as the Devil Cat between Devonport and Melbourne before moving to New Zealand in May 1999 to introduce that country’s first high speed roll-on roll-off ferry services across the notorious Cook Strait between the north and south islands. At the end of her New Zealand role the vessel was taken on charter by the US military. Their brief; to use the high speed craft to demonstrate its ability to perform specific mission scenarios and limited operational experiments in order to assess its usefulness in US Military and Coast Guard applications which require a platform to move troops, heavy military vehicles and equipment. 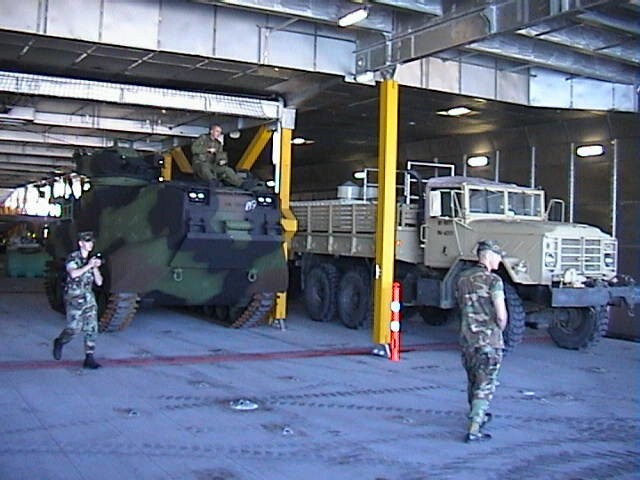 Several component commands of the Army, Navy, Marines and Coast Guard combined their resources to lease the Joint Venture for an initial one year period. Units in the experiment included the Army’s Combined Arms Support Command, the Marine Corps Combat Development Command, the Coast Guard’s Deep Water Project, the Office of Naval Research, the Navy Warfare Development Command and the Naval Special Warfare Command home of the Sea, Air and Land (SEALS) teams. For Incat the task of converting a practically brand new commercial ferry for military service was taken in its stride. The task was simple; modify and equip the vessel for troop transportation, including the construction and installation of a helo deck capable of accommodating military helicopters. In a world first for high speed craft, a 472 square metre helicopter deck was fitted to the vessel to handle large helicopters such as the SH-60 Seahawk and the CH-46 Sea Knight. The helo deck and a two part hydraulically operated vehicle ramp to allow rapid loading and discharge of vehicles from the stern or alongside were both designed by Incat’s Hobart based design team to meet full military specifications. One of the first accomplishments of the newly named HSV X1 Joint Venture was a winter crossing of the North Atlantic. In early February, 2002, she shot across the Atlantic from her base at the Little Creek Naval Amphibious Base, in Norfolk, Va, to Rota, Spain in just five days and fifteen hours. The US Navy’s fastest amphibious assault ships, in contrast, could cruise no faster than 24 knots. Furthermore, they require a draft of 8 metres of water to navigate. The Joint Venture can operate in only 3.6 metres of water, enabling it to come much closer to the shore than traditional naval vessels. During exercises in the Gulf of Mexico and along the Atlantic Coast, HSV X1 Joint Venture served as the command and control ship for a mine warfare readiness group of five other vessels. The squadron’s commander, Navy Captain Richard C Rush, said the catamaran’s capabilities enabled him to “think out of the box”. He added: “There are many things that you do with this ship that you can’t do with a minesweeper, which only has a speed of eight to ten knots.”. It immediately became very apparent that the vessel could be used in active scenarios and it was not long before she went on station in the Persian Gulf in support of Operation Iraqi Freedon. 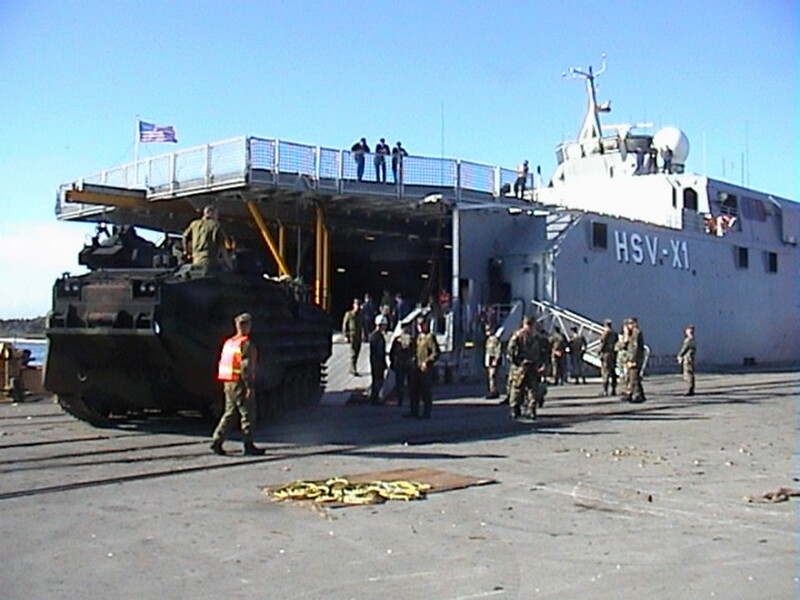 The HSV X1 Joint Venture played a special operations role in the first days of the war, serving as a floating forward staging base for Marine anti-terrorist security units and Navy SEAL teams. Major General Robert T. Dail said, “The testing of the HSV X1 Joint Venture during the lease period is part of the Army’s transformation goal of being able to deploy a combat ready brigade anywhere in the world within 96 hours, a division in 120 hours and 5 divisions within 30 days. We’re very excited about what we’re doing”. “The HSV X1 Joint Venture has proven its value in the Persian Gulf. The ship travelled 5, 191 nautical miles in seven days to reach Kuwait from Rota, Spain before spending 61 days on a variety of missions in the Persian Gulf,” he said. Range and endurance are not problems for Incat’s wave piercing catamarans. They are designed to have a cruising range of 4,000 nautical miles at 20 knots and can be refuelled at sea. In fact, HSV X1 Joint Venture circumnavigated the globe in 31 sailing days over a period of 7 months, travelling from Australia through the Panama Canal to the US Gulf Coast, then on to Little Creek, Virginia. She then made her less than 6 day Atlantic crossing to the United Kingdom. From there, she conducted exercises and tests in the extreme weather conditions along the cost of, and in the fjords of, Norway. From there, responding to the call for support for the war on terrorism, HSV X1 Joint Venture proceeded to Gibraltar and on through the Mediterranean and the Suez Canal to the coalition counter terrorism base in Djibouti. Then she sailed on to the Persian Gulf. After servicing in Gulf waters, she crossed the Indian Ocean and proceeded back across the Pacific Ocean to the US West Coast. In 2004 while the ship operated in Korean waters, two Black Hawk helicopters landed on its flight deck, the first such landings on an Army vessel since the Vietnam War. 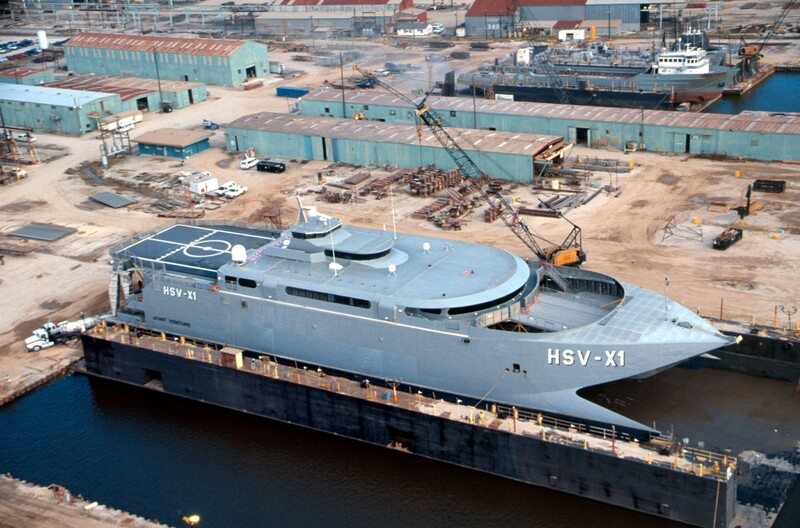 Speaking towards the end of the charter period Colonel Genaro Dellarocco, US Army commented, “HSV X1 Joint Venture has done very well during the lease, the senior Army leadership are very impressed and it has gotten their attention. It literally delivers Army transformation”. To date four Incat built high speed wave piercing catamarans have entered military service. The HSV 1X Joint Venture (Hull 050) was preceded by HMAS Jervis Bay (Hull 045) for the Royal Australian Navy, and followed by US Army Vessel (USAV) Theatre Support Vessel TSV 1X Spearhead (Hull 060) and the US Navy’s HSV 2 Swift (Hull 061).